Our Easter weekend full of delicious home-cooked food in Virginia was finished off by an excellent meal back in DC: dinner at Cafe Dupont. Mother Spice was staying in the attached Hotel Dupont for the night, and we decided to keep it simple and have dinner downstairs. Roxie had been to the bar (Bar Dupont. Are you catching on to the naming scheme?) before for their happy hours, 4-6 every night, when their usually $11 cocktails are half price. Of course, the opportunity for these cocktails was not passed up at dinner. Roxie and her roommate Lily are partial to the Alan’s Love, and Mother Spice enjoyed the Dupont Imperial. Choosing what to eat proved to be much more difficult than choosing cocktails, however, as none of us was starving but pretty much everything on the menu looked tempting. 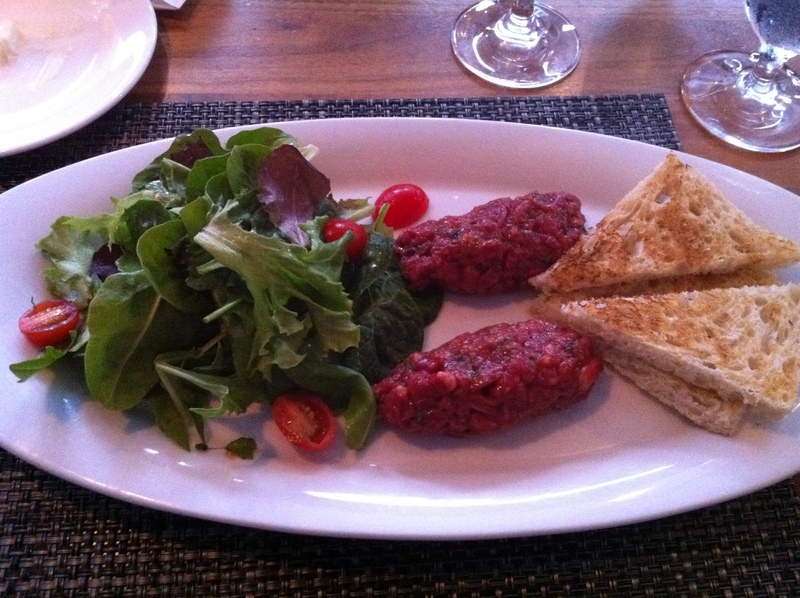 We eventually decided to split appetizers– Lily and Mom shared a pea risotto that looked excellent, while Roxie and I decided the time had finally come to try steak tartare. I enjoyed it very much– it was excellently spiced with a velvety texture, though the steak flavor was very subtle. For mains, Roxie and Mom both got the mussels with saffron– huge buckets of mussels, with accompanying french fries. While the mussels were delicious, to me, the letdown of the night were the fries. Not quite chunky fries and not quite the thin, crispy variety, they weren’t excellent but that didn’t stop me from stealing many. Lily got the appetizer crab cake as her main, which she polished off sharply. 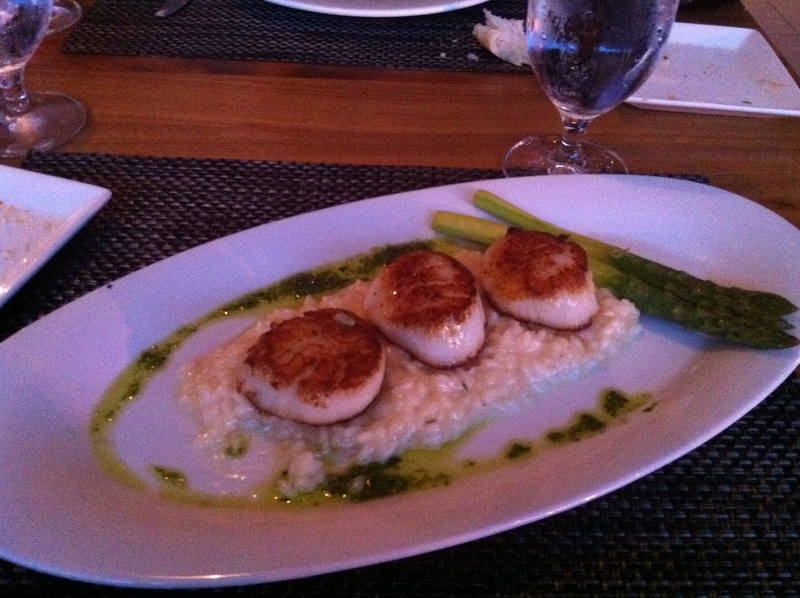 And though I was tempted by the steak frites (and well, everything) I ended up getting seared scallops on a bed of lemon risotto, with asparagus and a ramp pesto. 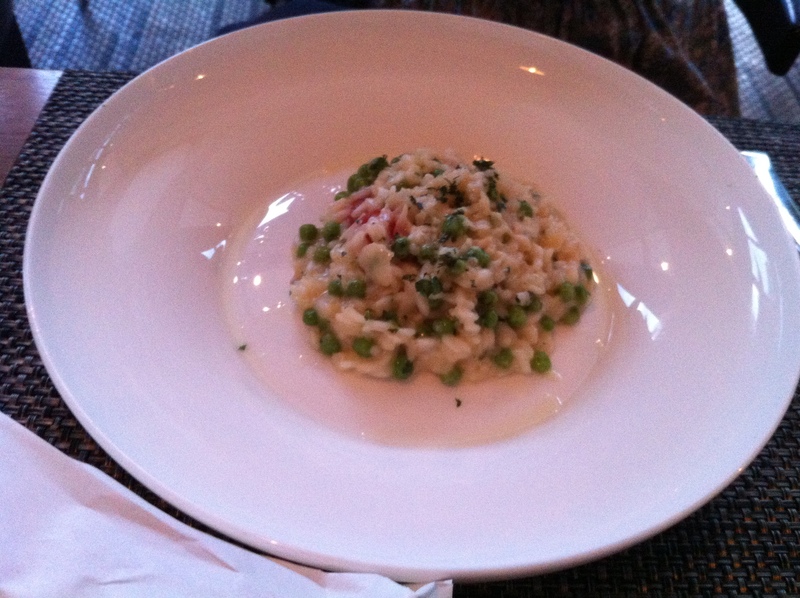 Words cannot express how much I loved this dish– seasonal, with three huge scallops perfectly seared and complemented by the creamy risotto underneath. I also appreciated the modest portioning (well, except for the amount of mussels)– I am always a bit put off by restaurants that give you enough for two people. Nonetheless, we were too full for dessert. An incentive, perhaps, to return again, although I didn’t really need one. My roommate had a Groupon to Hudson (25$ for a 50$ gift card) so we decided to go on a roommate-date and celebrate spring and jobs and grad schools. Since we had the gift card we ordered a lot of food, all of which was delicious. Hudson has a modern-American feel and is smart, but doesn’t make you feel like you have to be dressed up to go there. The food is also what I would describe as “Modern American”- things like Matzo Ball Soup, Tuna Tartare, Short Rib Tacos, Buttermilk Fried Chicken, and assorted brick oven pizzas. 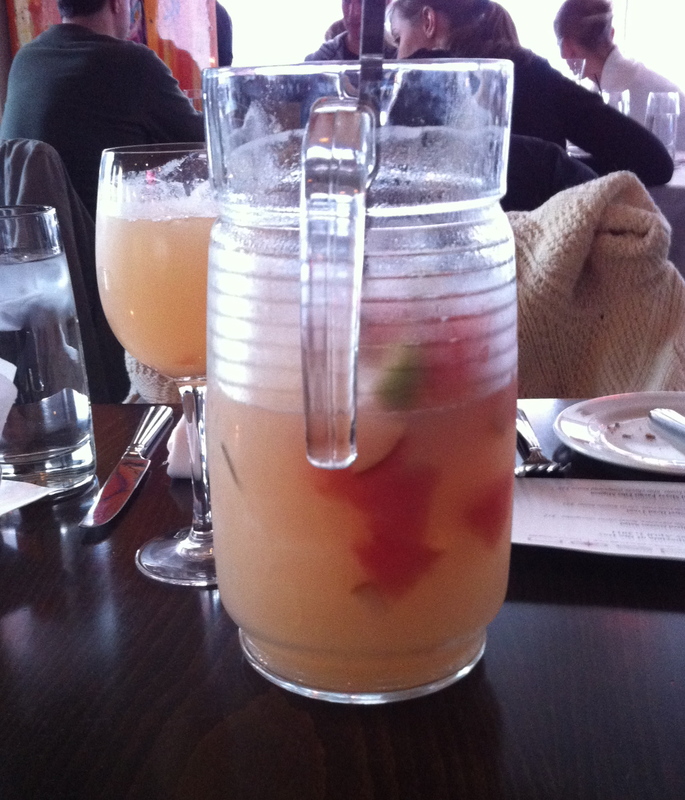 We obviously started with a pitcher of white sangria (described as serving 6-8 people, yeah, ok. There were probably 4-6 glasses in there). The sangria was described as “white sangria fusion of martin codax albariño, grapefruit, pear, sage, and lavender with cabo wabo reposado x-rated fusion margarita topped with sweet lime espuma.” Wow, that is quite the description, but basically it was grapfruity and good, but very tart. It was a little hard to finish the pitcher just because you got so full from all of the juices in there, but I would recommend at least a glass or two. They also have many other specialty drinks that sound equally complex but good. 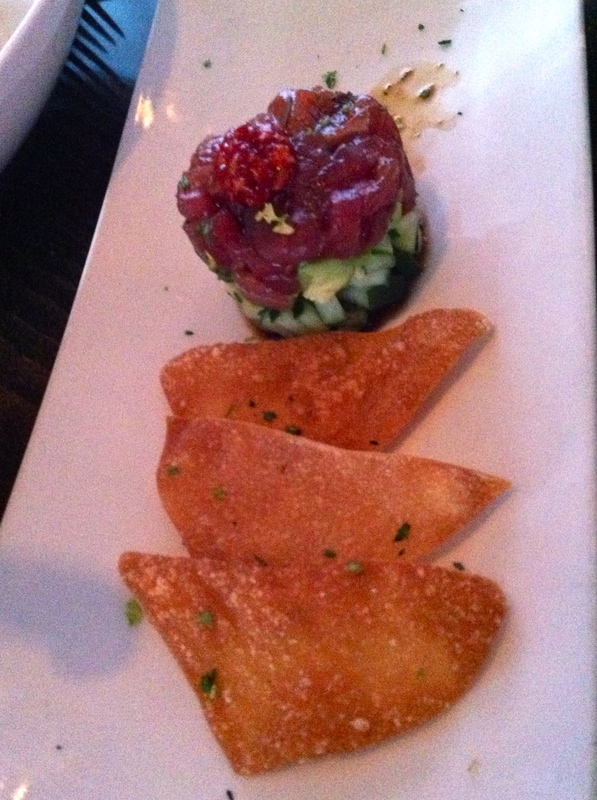 To start we shared two “tasters”- Tuna Tartare with avocado and cucumber, and a Duck Confit Leg. The tuna was delicious, very fresh tasting and bright tuna that went well with the avocado, and they gave you crispy wontons to scoop it all up with. The duck was also great- duck can sometimes be dry or overly fatty, but this was cooked well and very flavorful. The tuna was an appetizer sized portion, but if you weren’t too hungry the duck with potatoes and sherry sauce could fill in for a main course. 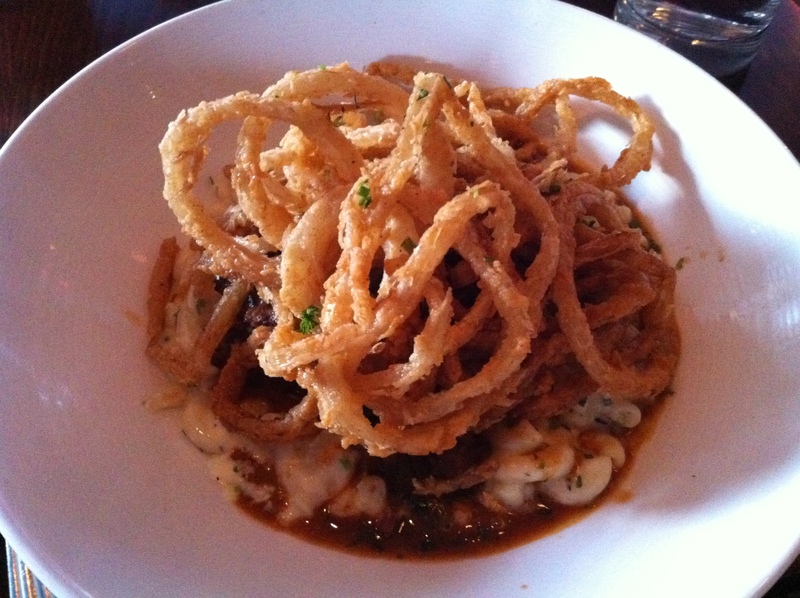 For the main course I got the Braised BBQ Short Rib, with smoked Gouda mac and cheese and onion rings. Since I have a hard time resisting mussels whenever I see them on a menu, I was very pleased that Lily ordered them so I could try some- these ones were Maine Mussels with a Thai curry and coconut sauce. My short rib was good, but the plate got extremely messy. The mac and cheese under the meat could have probably been a main course by itself, and you would have to be very hungry to finish it all. The creamy mac and cheese went well with the crispy onions and tender short rib, and my only complaint would be that together it was a rich dish, and a tiny bit salty for my taste. Lily’s mussels were yummy- the Thai curry sauce was light and not overpowering, and we got Parmesan Truffle fries as well that were good, although could have been crispier. But put truffle on anything and I will eat it so I was certainly not complaining. All in all this was a satisfying and tasty meal, and I would go there again for a special occasion or just when I want to treat myself. The happy hour specials are good, and they have items on the menu (such as pizzas) which are quite affordable and I’m sure every bit as good as the more expensive options.